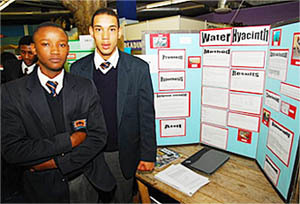 Science Expo's - The Cape Academy of Maths, Science & Technology: Centre of Excellence! ... "Praestantia"
The Cape Academy’s five ‘Gold Medal Projects’from the Cape Town Regional competition, went off to Pretoria to represent the school at the Eskom Expo National competition. They were: Thandoxolo & Haneem (Gardening with Rubble), C-G Barbery (Fish Food), Chevaan & Chad (Global cooling with SO2), Jenaide & Sixolisiwe (Water Hyacinth) and Joshua & Yaghia (Township Geyser). At the Nationals, the competition was very stiff since hundreds of regional gold medalists from around South Africa were vying for only 50 available National Gold Medals. The final outcome for the Cape Academy was: Joshua & Yaghia won gold medals and were awarded a note book laptop each, Jenaide & Sixolisiwe won Silver Medals, while Chevaan & Chad as well as Thanduxolo and Haneem won Bronze medals. This was a noteworthy achievement for the Cape Academy since it was our first time to be entered into this competition at a national level, and to win medals there was like the proverbial “cherry on top”. We look forward to an even greater performance in 2010. The regional leg of the Western Cape Eskom EXPO for Young Scientist was held for the seniors at the MTN Science centre on the 19th and 20th August. Twenty three of our learners took part. In total there were 16 projects. This involved many weeks of hard work and late nights. The final outcome was well worth all the time spent. The learners did us proud. Two of our projects received a bronze medal, one received a silver medal and 5 projects were awarded gold. All awardees that received gold, 9 in total will compete at the National Expo in Pretoria in September. WE WISH THEM WELL!